Welcome to His Majesty's 22nd Regiment of Foot! A group of men and women from many walks of life who share an interest in bringing history to life. As Members of our parent organizations, The Brigade of the American Revolution, and the British Brigade, we work to fulfill their joint purpose: To keep alive the Life & Times of the Common Soldier of the American War for Independence. To that end we have recreated, as accurately as our research has allowed, a battalion company of the British 22nd Regiment of Foot. What is the 22nd Foot? The 22nd Regiment of Foot was one of the British Infantry Regiments that served King George III against the Rebels in North America during the Revolutionary War. The Regiment was raised in the town of Chester, England in 1689, and remains to this day part of Great Britain's Regular Army. 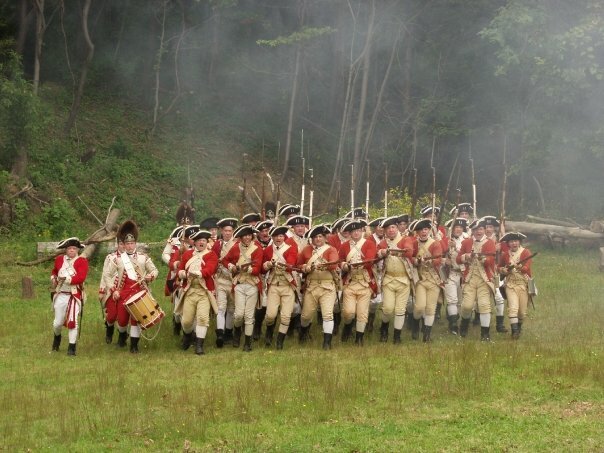 Our unit depicts the Colonel's Company of the 22nd Regiment, uniformed and equipped as it would have been during the British Army's operations around New York City and Rhode Island in 1776-1779. What does the 22nd Foot do? We portray the military life and customs of the British Soldier of this period in all its aspects. Far from Being the "mindless robot" represented in popular mythology, the British Soldier was a formidable adversary who won a majority of the battles during the American Revolution. On weekends during the Spring and Summer, we gather with other recreated regiments to present "living history" demonstrations of drill, camp life and military field tactics at historic sites throughout the U.S. and Canada. We deliver shows and talks to State and National schools and interested civic and fraternal groups. We have even been to England to do public shows and demonstrations as invited guests of English Heritage and our own Regiment "back home". All members bear the cost of their own uniforms, equipment and travel. We have no special requirements. In order to take the field as a Soldier under arms, a man must be at least 16 years old, of suitable health to spend weekends outdoors, and of sufficient means to acquire the necessary clothing and equipment. New recruits wishing to portray Regimental Drummers or Fifers may take to the field at 12 years of age. We make everything that we can ourselves. Other items can be purchased from approved artisans and suttlers. Our uniforms and equipment are the product of years of research, and we take great pride in their accuracy. Only authentic materials are used - wool, linen, brass, pewter, leather, etc., And we use correct period tailoring and construction techniques throughout. The armies of the time had a large number of tradesmen/women and children attached to them. 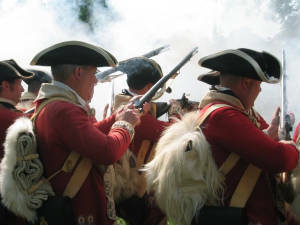 As "living history" is definitely a family oriented hobby, wives, children and sweethearts of our modern-day soldiers can take part in representing their 18th Century counterparts. As Regiments moved from camp to camp during the Revolution, wives of the soldiers earned extra money by washing, mending and cleaning, or by selling food and spirits near the camps. Schools were also sometimes kept for the children of the Regiment, who often grew up to be soldiers, experiencing no other environment during their lives. 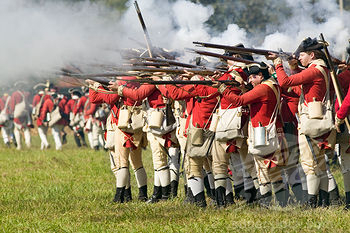 Clothing patterns for civilians, which observe the same standards of accuracy as the soldiers, are available from one of our parent organizations - the Brigade of the American Revolution.